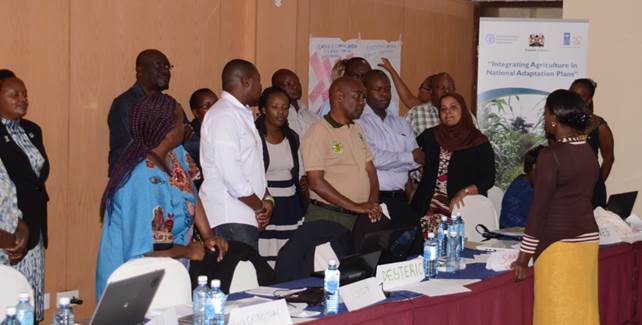 As a follow up to a capacity needs assessment on gender knowledge in key government institutions, the FAO Kenya and the UNDP Kenya organized a three days training in Nakuru to improve the capacity to integrate gender issues in climate change adaptation planning for the agriculture sector. The training has been organized under the auspices of the Integrating Agriculture in National Adaptation Plans project which is part of a global support programme being implemented in eight countries (Kenya, Uganda, Zambia, Uruguay, Philippines, Nepal, Thailand and Vietnam). The training has brought together mid and senior level government officials from the Ministries of Agriculture, Livestock and Fisheries, Environment and Natural Resources, Devolution and Planning, Kenya Meteorological Department, National Genetic Resources Research Institute, Kenya Forest Service, FAO, UNDP and UNEP. The primary aim of the training is to enhance the skills of the trainees to mainstream gender issues in the planning, design and implementation of climate change adaptation policies, plans and projects in the agricultural sectors. The lead facilitators are Queen Katembu- Head of Gender and Human Rights Unit at FAO Kenya, Dr. Kaisa Karttunen- Climate Change Adaptation Policy Expert and a member of the Global Project Support Team and Beatrice Mwaura- Gender Officer at the Ministry of Agriculture, Livestock and Fisheries. The first day of the training is dedicated to establishing a common understanding of climate change adaptation policy frameworks at the global and national level and to cultivating why gender matters in this context. Other important topical issues to be covered on the first day include gender analysis of climate change impacts and adaptation options. The second day of the training will focus on deepening the trainees’ understanding of the entry points to address gender issues during formulation and implementation of climate change and agricultural policies. On the last day of the training, participants will delve deeper in to how to develop and implement gender-responsive projects. Time will be devoted to exploring different actors’ roles in promoting gender equality, in particular how the participants- who have management responsibilities-can ensure gender sensitive working approaches are used. It is hoped that the skills acquired will help ensure that government adaptation interventions in the agriculture sector are gender responsive and transformative. 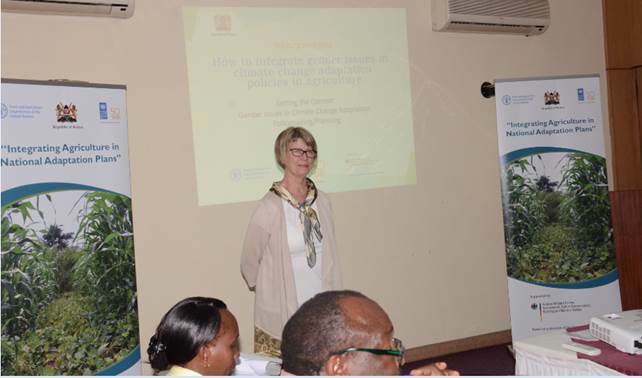 Dr. Karttunen, climate change adaptation expert and a member of the FAO global project team making a presentation on how to integrate gender issues in climate change adaptation policies in agriculture. Trainees being taken through a practical exercise session on gender quality, gender equity and social inclusion by Beatrice Mwaura (Gender Officer at the Ministry of Agriculture, Livestock and Fisheries).